I got a beautiful new Bellroy, Hide & Seek, wallet for Christmas, from Rose. Upon opening it, I was a little hesitant. I’m very selective when it comes to wallets and have aimed to keep mine as slim and functional as possible. You can see my old one as a prop in my post about the future of money. However, I was wrong to be concerned. Bellroy, the maker of the new wallet, is focused on providing beautiful and minimilist products. It’s designed to be slim and even has several hidden sections to allow you to keep things stored safely away, without increasing the width or carrying superflous things. The other thing I really liked, is how well the brand has been designed. Upon opening, you’re presented with the card you can see in my picture above. It teaches you how to put things in your wallet! Crazy, I know, but there are in fact many secret hidden panels that I wouldn’t have found were it not for the card. Check out this great video below, walking me through how to find even more secret sections in my new wallet. Finally, Bellroy also have a great blog at Carryology.com which has heaps of interesting articles about carrying less and how to do it. There’s also a beautiful piece called ‘A return to craft’ that speaks to the authors desire to take products currently made through mass production and return them to the hands of a craftsman. It’s a great post with 5 other companies, one of which is in Melbourne, that are returning to crafting their goods. All in all, the whole unboxing experience has been awesome and it’s a lesson for others to follow in regards to taking a simple item and appreciating how important it is to the new owner. Well done, Bellroy! 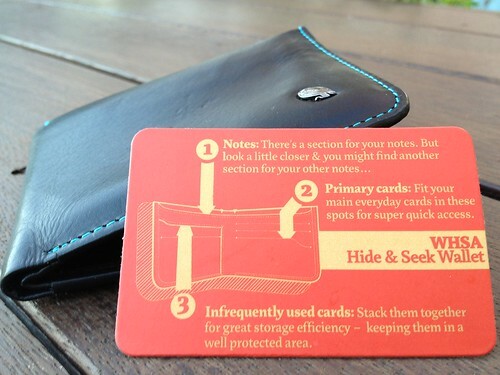 That’s a very nice wallet – and I love finding out about these personable handcrafting companies. My wallet’s of a similar ilk – a recent Green & Golden Cypress from Braithwaite Wallets. Connor’s emails are open and friendly, and it certainly feels like something special to me. He makes a point of talking about how the leather of the wallet will change over time, and speaks of that as character, not so much ‘wear and tear’ – which certainly made me less worried about mine changing colour from use. Also, kinda wishing you hadn’t pointed out Tailfeather via the ‘Return to Craft’ link – their bags look very slick, albeit expensive – certainly a cut above what I’d normally be looking at (and that’s Crumpler, which aren’t cheap either). Something to go on a wishlist, perhaps. Thanks Pat! I really love the idea of the leather changing over time. It’s something only a craftsman could say as they have built up a life of seeing the materials they use get worn. I imagine it’s probably similar, albeit tenuously, with the code you write. And yes, that return to craft post is amazing. The other Melbourne company listed in it is another amazing wallet company. The bags also look stunning. Sigh. Bellroy, for what it worth, is also Melbourne based.